Beloved quilt world legend Yvonne Porcella died on Friday. She will be greatly missed by her family and friends and by so many in the quilt world–her fellow artists, her students, her colleagues at SAQA and the Quilt Alliance. Many of our sister organizations have also documented and honored Yvonne. (Find links to these resources at the end of this post.) In 1989, Yvonne founded the Studio Art Quilt Associates organization and remained committed to its mission until her death. In 1998, she was inducted into the Quilters Hall of Fame in Marion, Indiana. That same year, Yvonne was named the 5th recipient of the Silver Star Award at the International Quilt Festival in Houston, Texas. Yvonne was very supportive of the Quilt Alliance’s newest project, Go Tell It at the Quilt Show! which debuted in 2012. We recorded two Go Tell It!’s with Yvonne in 2014: the first during SAQA’s 25th anniversary conference in Alexandria, Virginia and the second at the International Quilt Festival in Houston, Texas. Yvonne’s life and work was documented by the Quilt Treasures project in 2002. Quilt Treasures, a joint project of the Quilt Alliance, Michigan State University Museum and MATRIX Center for Digital Humanities and Social Sciences, documented the stories of a limited number of notable individuals – quiltmakers, designers, business people, collectors, scholars, publishers – who were instrumental in moving the 20th century quilt revival forward in some significant way. As a founding board member of the Quilt Alliance, Yvonne contributed to many aspects of the organization’s projects and initiatives, including co-founding the Alliance quilt contest. In 2006, she worked with Karen Musgrave to launch this annual fundraising and documentary effort, and since then, artists from the United States and around the world have created and donated 872 quilts to support the Quilt Alliance. For the past nine years, Yvonne has made and donated one or more of her own quilts to the contest. Here are those quilts, now documented both on the Quilt Alliance website as well as in The Quilt Index. “Under One Roof”, 2006 for the “Put a Roof Over Our Head” contest. “Red Hearts in a New Home”, 2006, for the “Put a Roof Over Our Head” contest. “Toolman”, 2006, for the “Put a Roof Over Our Head” contest. “Cover Us”, 2006, for the “Put a Roof Over Our Head” contest. “A is for…” (Alliance in Asheville)”, 2006, for the “Put a Roof Over Our Head” contest. “Four Sided Journey”, 2008, for the “My Quilts/ Our History” contest. “AAQ” Alliance for American Quilts in a Crazy Style”, 2009, for the “Crazy for Quilts” contest. “Do You Have a Bernina?”, 2009, for the “Crazy for Quilts” contest. “Folly Flash”, 2009, for the “Crazy for Quilts” contest. “Redotwo Ten”, 2010, for the “New from Old” contest. “Hi 5”, 2011, for the “Alliances: People, Patterns, Passion” contest. “Yipee I’m Free”, 2012, for the “Home Is Where the Quilt Is” contest. “Guard Dog In A Tangerine Tango World”, 2012, for the “Home Is Where the Quilt Is” contest. “QA at 20”, 2013, for the “TWENTY” contest. “The Mocha Tree”, 2013, for the “TWENTY” contest. “The Best”, 2014, “Inspired By” contest. “Oski Loves The Birds”, 2015, for the “Animals We Love” contest. Yvonne’s struggle with cancer was long and daunting. As a former nurse, she knew her body and her illness with precision. She managed to stay incredibly positive in the face of her prognosis, and maintained a lightness of being and sense of humor that fueled her fight. Yvonne explaining Quilt Match Manhattan to the crowd at Quilters Take Manhattan 2013. She was one of the judges and dressed appropriately in black and white stripes (part of that spunky YP brand). When Yvonne had to cancel her presentation at the Quilt Alliance’s 2015 Quilters Take Manhattan event, it was not her battle with cancer that prevented her from attending. She called me, laughing, about a week before the event to explain that she had dropped a giant bottle of ketchup on her foot and her doctor wouldn’t let her fly in that condition. She even texted me the photo of her foot as we talked, so we could mock the situation together with proper visual aides. Yvonne making me (and anyone within earshot) laugh at Quilters Take Manhattan 2014. Keeping up with the latest technology, while never losing touch with handwork was a central theme in her optimism and excitement for the future. In this Quilters’ S.O.S. – Save Our Stories interview conducted on November 29, 1999, Yvonne talks about anticipating the Twentieth Century. Q.S.O.S. Interview, Nov. 29, 1999. International Quilt Festival, Houston, Texas. Interviewer, Jeri Baldwin: What have you done with thinking about the Twentieth Century in your work and your teaching? What do you think you’ll change, or will you want to change, or what do you want to leave the same? What are you going to take into the Twenty-first Century as a quilter and as a teacher? Yvonne Porcella: I’m still going to take the passion I have for doing it by hand. I’m going to take the passion of creating something totally for myself, that pleases myself, that comes from myself. I am not interested in scanning it on the computer. I am not interested in coloring it on the computer. Because to me the reason I am an artist, which was very difficult for me to even reach that point where that I can verbalize it because I was trained as a nurse. I was trained as a mother, as a grandmother and to be an artist was to say to people, ‘Well, I think I am an artist although I am not academically trained.’ But I have a passion and I know that if I don’t do the work that I’d be unhappy. So for me the twenty-first century will be similar to the twentieth century because I will continue to work until I can no longer work. The wonderful part of being an artist is that the wonderful ideas never stop so the concept of the creativity that will be produced in the–however long I am going to live is very exciting to me. On behalf of the board, staff and membership of the Quilt Alliance, I want to send my condolences to Yvonne’s family. Rest in peace, dear friend, colleague and treasure. You inspired us to be our Best. Please leave your own remembrance of Yvonne below in the comments. Please indicate “In Honor of Yvonne Porcella” in the memo or description line. The Quilt Alliance is thrilled to have Craftsy as a Platinum sponsor for Quilters Take Manhattan 2015. Don’t miss this free online video class, 2015 Block of the Month, featuring Jinny Beyer. The Quilt Alliance, along with our partners at Michigan State University,* is proud to have documented Jinny for the Quilt Treasures project. 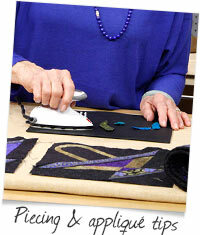 Watch a mini-documentary about Jinny, see a photo gallery, a biography and much more on the Quilt Alliance website here. *Quilt Treasures is a join project of the Quilt Alliance, Michigan State University Museum and MATRIX: Center for Digital Humanities & Social Sciences at MSU. Bring a gorgeous quilt to life one block at a time with my free online video class 2015 Craftsy Block of the Month, created in partnership with RJR Fabrics. Join me, quilter and designer Jinny Beyer, and learn an array of my signature techniques as we sew a stunning, Craftsy-exclusive quilt. Once you enroll, you’ll enjoy a new lesson on the first of every month. Watch it at your own pace, and discover everything you need to know to put together 13 beautiful blocks and finish this captivating quilt! As we sew, you’ll have the option of hand or machine piecing a variety of basket and flower blocks. I encourage everyone to try out hand piecing at least once – it’s one of my favorite techniques, and enables you to create perfectly precise points and sew set-in seams with ease. I’ll also demonstrate how to use templates and specialty rulers, and reveal how to fussy cut border stripe fabric for magical effects inside pieced blocks. Border stripes aren’t just for borders anymore! I selected the fabric for this quilt from several of my best-selling collections, and I know you’ll adore the luminous hues, captivating prints and gorgeous border stripes. To make an exact replica of the quilt I’ll be working on throughout class, purchase the exclusive 2015 Block of the Month Quilt Kit on Craftsy! We’ll begin class with my secrets for using color in quilts, and then dive right into our January block: the May Basket. Learn how to use templates and a few simple tricks to easily cut the necessary pieces, and find out how to join a string of triangles and maintain their precise points – without cutting your thread. In the next lesson, assemble the lovely Basket of Fruit block as you discover how to mark and join black and brightly colored half-square triangles. Then, learn how to sew set-in seams both by hand and by machine for the beautiful Ash Basket block. The Cherry Basket is up next, and we’ll use the golden ratio principle and bias strip curved appliqué to assemble this block. To create the crisp points in our Pine Needle basket block, we’ll dive into a lesson on foundation piecing. Next, learn how to use partial seams to make complex-looking blocks a cinch as we sew the White Oak and Birch Basket blocks. Appliqué has undeniable visual appeal, and I’ll show you how to use Apliquick tools to create polished appliqués faster than ever for our Beech Basket block. Paper piece the Basket Full of Lilies block, then learn how to apply log cabin construction techniques to complete the Dahlia and Daffodil blocks. Before you know it we’ll be sewing our final blocks! Work with five and then eight foundations at a time to create the eye-catching Harlequin and Foxglove blocks, and find out how to frame each for easy paper foundation removal. Put the finishing touches on this exquisite quilt with a few of my favorite methods for sashing and cornerstones. Use perfectly proportioned border prints to harmonize your quilt, and finish with a crisp miter for clean, professional corners. Sign up today for 2015 Craftsy Block of the Month, and join me in sewing a quilt that’s sure to become the prized jewel of your collection! I sewed my first quilt in 1972, and the rest is history! I spend my time designing fabric, writing, teaching and quilting, and I wouldn’t have it any other way. I’ve authored 12 books, been inducted into The Quilters Hall of Fame, and have had my Ray of Light quilt named one of the “100 Best American Quilts of the 20th Century” by Quilter’s Newsletter Magazine. I love sharing my passion with fellow quilters, and teach classes around the world – and now, right here on Craftsy! Build your skills and a breathtaking quilt, one fun block at a time! Enroll in the free online video class 2015 Craftsy Block of the Month today!